FRCC Yoga I course covers all aspects of yoga from history, philosophy, pranayama, meditation, asana, chakras, etc. Combining the cooling practice of Yin and the warming practice of Yang, this class offers us a way to experience, through our bodies, true balance. Class begins with poses that are held for up to 3-5 minutes to stretch deeply and establish an internal quietude. Then, we flow to the rhythm of our breath, creating heat through movement, releasing toxins from body and mind, opening us to an energized and calm state of being. Yin Yoga offers us an opportunity to surrender and slow down, a perfect complement to our more active (Yang) yoga practices and lifestyle. Yin primarily focuses on floor poses that are held with muscles relaxed for 3-5 minutes. Holding the postures for this length of time gently and deeply stretches connective tissue in the lower back, hips, spine, and legs. As we slowly work into the connective tissue of your body we find more freedom and mobility in our joints. The results are relief, comfort, and flexibility. This time also allows us to focus on the breath and remaining present in the moment. As we become quiet we can experience powerful mental and emotional benefits cultivating the priceless ability of letting go. Vinyasa is a method of yoga in which movements form a flowing sequence in coordination with an intentional breath rhythm. The intelligence of the breath teaches us to be fully present in our yoga practice and ultimately in our lives. Linking the power of the breath to the movement of our bodies develops focus and concentration allowing stress to be released. This class will inspire you to explore your potential (physically, emotionally, and mentally). Tap into the joy within your heart and experience your true strength. Enliven all 5 of your senses with an aromatic, high-vibrational, Level 1 practice of mantra, meditation, & movement that will leave you feeling like you just left the spa! Relax, restore, & renew your body, mind, & spirit with supported & gentle restorative poses & a yoga nidra practice that resets your nervous system, reduces physical pain, & provides for a deep sense of peace & relaxation! Please join me Tuesday evenings for a blissful journey through vibrational sound healing with Tibetan and Quartz Crystal Bowls & Gongs. ♥ Guided Sound Healing Meditation The practice of nada yoga, the yoga of sound, brings a deep unity with both the outer and inner experience of the vibratory world of which we are all inseparable from. Nada Yoga means "union through sound" and it is an ancient spiritual practice of transformation through vibration. Meditation on sound is one universal path to self realization. It is a powerful healing art that engages the brain in alpha-theta brain wave activity and balances hemispheric activity. In this healing meditation explore consciousness through vibration. Experience the higher state of consciousness that sound healing initiates through bringing the physical and subtle body into a unified resonant state. Journey into sound healing through a variety of Tibetan singing bowls, quartz crystal bowls and gongs. This type of meditation creates a clear and serene experience that has a lasting effect of inner peace and awareness. This class is wonderful for anyone who is a novice at meditation as well as someone with a regular meditation practice. Combining the deeply healing practices of restorative yoga and yoga nidra (yoga sleep) we cleanse out both our physical and energetic systems. 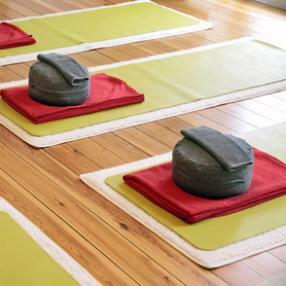 We begin class with restorative postures incorporating an abundance of props to provide comfort and nurturing. This style of practice offers us an opportunity to rest in supported postures (asana) for several minutes allowing our bodies time to release tension. The last portion of class is a luxurious period of rest using blankets and bolsters to support us. We listen and feel as we are guided through the powerful relaxation practice of yoga nidra. Having been practiced for over a thousand years yoga nidra is profoundly effective at reducing stress, enhancing resilience, and fostering a deep sense of wholeness.